2011 has been the year of two star-bloated tribute albums to Buddy Holly–this year would have been his 75th if the music hadn’t died. 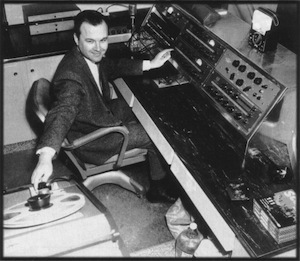 Every time there’s an occasion to contemplate Buddy’s behemoth legacy, it’s difficult not to mention Norman Petty, the man behind the boards for the Holly recordings between 1956 and 1958. Petty wrote some chart-toppers of his own during the ‘50s. The spoils of which provided the capital to start his homespun Norman Petty Studios in Clovis, New Mexico. The studio attracted scads of local talent from West Texas and around the Southwest, and over the years, Petty put to tape Buddy Knox, The Fireballs, Roy Orbison and a young Waylon Jennings. Regardless, Petty was a remarkable record producer. The man built his own studio in that provincial little town of Clovis way back in the 1950s. He cranked out recordings that rivaled the quality at Sun or any other “big-city” studio. He was an experimental and meticulous engineer, constructed his own machines, and even fashioned an echo chamber in his dad’s garage. In 1985, Vi, Norman’s wife (and herself a mean piano player), showed off the studio in the gentle, reverent, Paul McCartney-hosted documentary, The Real Buddy Holly Story. To this day the place hasn’t changed much and if anything has embraced its podunk roots (if you’re driving through Clovis, you can still get a tour). Petty was doing everything the great studio pioneers were but on his own terms and on his planet–in that Macca doc, Holly’s NY record label execs laugh it up as they recall having to fly out to Clovis. Petty’s success with Holly lead him to ape his own work again and again, but in that way, Buddy’s style had a lasting effect on Petty’s aesthetic. There’s a small ocean of bands that recorded at that studio before Petty closed up shop in 1969. Several were Petty’s own studio creations, and on many post-Holly recordings you can hear echoes of the rock legend’s swagger bleeding up through the speakers. A trio of compilations–From the Norman Petty Vaults–came out in 2007, and they do a solid survey of the catalog beyond the hits. this is killer; had no idea. Recorded with Petty somewhere around 1968-69 with a band called White Lightnin’. If it weren’t for Norman. Buddy Holly may not have happened, Petty wrote the monstrous Holly hits and was a musical prodigy as a child. Holly was a great performer, as was Petty. But don’t forget the humble words once uttered by Holly. Those words were “If it weren’t for Elvis, none of us would be here.” ELvis was the King of rock and roll, not Holly, as some people believe. Frank Blanas has written a fabulous historical account of Norman Petty with this book…all of you who are interested in Norman Petty’s history would enjoy it! The rift between Petty and Holly was (in my view) due to the fact that Buddy wanted to live in New York where Maria Elena could be near her Mother, totally understandable, but Petty’s disappointment that Buddy would simply drop him and the Crickets after all the time and effort that had occurred at Clovis is also understandable. After Buddy died, Petty took a lot of flak, but the crash was not his fault and I find it hard to believe that Buddy Holly went on that tour for any other reason than he wanted to. It was what he did. It’s all a long time ago now. Thanks to both Holly and Petty, Buddy’s music lived to influence several more generations (including myself). Bless them both.